First, let me apologize for meowmy; she has been SO busy, things have been kind of crazy here, so she took over the compooter and hasn't let us post on the bloggie... Furriends, please forgive her - we already punished her with a good time out, she is learning her lesson, we promise! Second, I wanted to purrsonally thank you all for the love, purrs and prayers... Oh, and for the New Year's wishes too! You are very special to us, and your love and support make all the difference in the World to us! I am eating normally, and doing really well when it comes to my diet, meowmy is very pleased with me! I don't even need to be spoon-fed anymore! I eat all my stinky goodness and my dry food too like a good boy! The prednisolone by itself didn't work, so the V-E-T added back the yucky metronidazole. So, get this furriends, I am taking: Prednisolone every other day, my Stomatitis medicine once a day, Metronidazole twice a day, and the probiotics... whew! It's a LOT! The good news is, meowmy looked at the box and she said wow.... Bugsy, I think I see sooooome form here! She said my poop is not all formed, but about 1/3 of it was formed! Well, that is a start! For someone who was pooping liquid, that is definitely an improvement! Ok furriends, sorry for the TMI, got a bit too excited about my poop there for a bit! I still have some ways to go, and then of course making sure that I will be ok once I am out of the meds - but that will be later... Let's not borrow trouble now, like you hoomans like to say, right? Meowmy was feeding her pill treat a few days ago when she heard a crack. She thought Gracie had bitten the pills, but noticed that Gracie was opening her mouth very wide as she ate, and that was concerning... She started watching her closely... All of the sudden she started having a hard time swallowing, and she stopped eating as with every bite she would just open her mouth as though she was in pain. Time to rush her to the dentist. Luckily, they took her in on the same day... She had to have surgery to extract her canine, shave the bone, put a small bone implant. 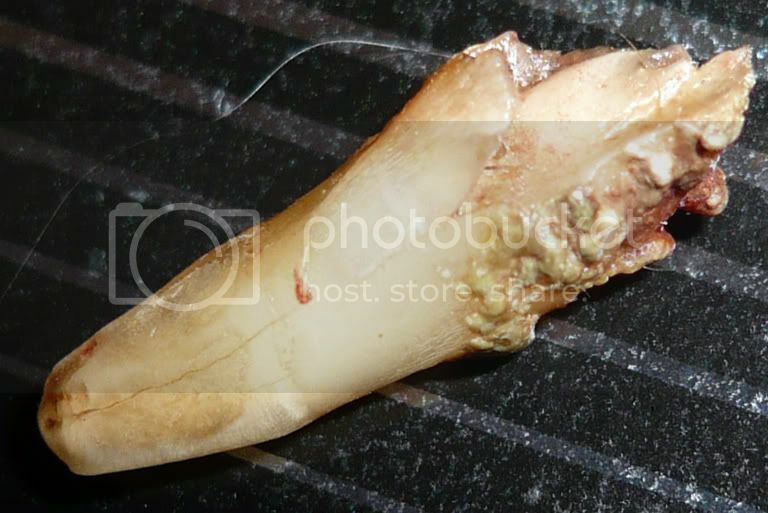 The tooth was so diseased that it created a hole, an oral-nasal fistula, and she will need to have a second reconstructive surgery in about a month or so, to close that hole. It was also infected, so the cavity was left open to drain. The tooth was a mess! If anyone has the curiosity to see it, the picture is here. I am not posting because it is too ugly! She is in a lot of pain, but today she started eating again, thank goodness! This didn't come in a good time... Meowmy is broke... She was already in bad shape with all my vet bills, now with this surgery she is beyond broke! The vet did give meowmy a discount, but even so, the bill was still $400, and then there is the other surgery coming up, and I have a feeling that bill ain't gonna be pretty. Oh, no, poor Gracie! Lots of purrs and healing universal Light to her from all of us. And lots of purrs to you, too, Bugsy. We hope you continue to improve! Your mom could contact Gracie, the auctioneer at the Cat Blogosphere, about holding an auction to help with the bills. We had one in November for Derry's dental back in June and it was a godsend, 'cause the mom had already spent thousands of dollars on us (3 dentals in 9 months, plus other vet bills). Ask. Seriously. That's part of what the CB does. It took the mom a while to overcome her pride and ask for help, but it really was a blessing and kitties and beans around the CB have wonderful hearts. We are so glad you are doing better, Bugsy, and that Gracie's surgery went well. Hi Bugsy, we're glad you're doing better, keep your paws up... now we're purrin 'n' prayin for little Gracie; oh, toofy-troubles can really put the hurty on. So, be better soon! And happy new year to one and all. Bugsy, we're so happy to hear that your medicines are working and you are feeling better!! But we're sorry to hear about poor Gracie's toof...we hope she is feeling better soon. We will purr hard for everyone. That is very stressful to have so much going on. We are glad to know you are doing so much better. We are so sorry to hear about Gracie, but Kim from Fuzzy Tails is right ... I bet we could do an auction for you and help out with those Vet bills. Always something with more than one pet. We hope Gracie and Bugsy will both keep doing better. I am so glad that you are feeling better, Bugsy, and eating and drinking like you should. Poor Gracie! I wince just thinking about it. I hope that the dentist can make her all better again. Herman sends healing purrs to all of you. Bugsy we are very happy you are feeling better and eating up your fuuds. Paws crossed for fully formed poops soon. We haven't met Gracie before and thinks she's lovely. Poor girl that cracked canine must have been so painful, she must feel much better now. Props to Caroline for taking Gracie in when her previous person couldn't cope.